NEW HAVEN - Two thoughts kept running through Alex Copeland's mind as his Yale team prepared to take on Harvard for the Ivy League championship and an NCAA berth. 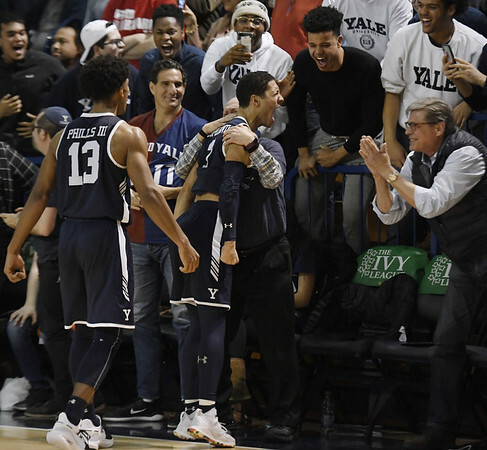 Copeland scored a season-high 25 points and Yale beat the Crimson 97-85 for its second NCAA Tournament trip in four seasons. “Visualizing those moments ... it's been going on for so, so long that to actually be here and to be talking about it sitting next to these guys feels so surreal and it just feels amazing,” Copeland said. “He's had a tremendous career and he stepped up big time for us tonight,” Yale coach James Jones said. “It's a game of runs and we weren't able theirs going down the stretch and ultimately that led them to get the victory,” Aiken said. “I looked at the clock and I looked at the rest of the guys on the court and I said, ‘We've got to do it without him. We've got to hold it down until he can get back in the game,’” Copeland said. Posted in Newington Town Crier, General Sports on Sunday, 17 March 2019 17:26. Updated: Sunday, 17 March 2019 17:29.